HEC gives 1463 scholarships in 2017. During the year 2017, HEC awarded 395 overseas scholarships and 1068 indigenous scholarships in various disciplines. Under International Research Support Initiative Programme, 412 PhD scholars proceeded for research abroad, each for a period of six months. While under bilateral agreement for Hungaricum Scholarships, 157 students proceeded to Hungary for PhD, MS and BS studies. Besides embarking upon the execution of US-Pakistan Knowledge Corridor, HEC launched Allama Muhammad Iqbal Scholarship Programme for Afghan National Students under which 3000 scholarships will be awarded to Afghan students. HEC also signed a Memorandum of Understanding with Turkey to avail scholarships for Pakistani youth to study in Turkish universities. HEC held a plenty of deliberative sessions to discuss the modalities of Pakistan-UK Knowledge Gateway with all the stakeholders. HEC also launched the ‘Provision of Higher Education Opportunities for Students of Balochistan and FATA, Phase-II’ under which a total of 3900 students from Balochistan and Federally Administered Tribal Areas (FATA) will be extended financial support to acquire education. In the said year, HEC and China Road and Bridge Corporation (CRBC), a state-owned company of the People’s Republic of China, signed a Document of Understanding under which the later will sponsor 30 Pakistani students for Master’s degree programme in Transportation Engineering at Southeast University China consecutively for two academic years. 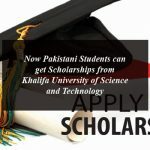 The scholarship will be fully funded and cover tuition, accommodation, return airfareand living stipendfor all the awardees. As a whole, HEC approved 22 Development projects worth Rs. 48 billion for universities in the year. Moreover, HEC launched the Prime Minister’s National Laptop Scheme (PMNLS) Phase IV & V. So far, 300000 students have benefited under three phases of the scheme executed by HEC. With the efforts of HEC, the laptops assembly plant has been installed in Pakistan and students are now able to get made-in-Pakistan laptops along with Evo devices under the scheme. As the quality of engineering education in Pakistan improved further due to initiatives and efforts of Pakistan Engineering Council (PEC) and HEC. It was in June 2017 that Pakistan was declared as Full Signatory of the Washington Accord. Engineers registered with PEC will now be considered at par as world class competent professionals and will not be evaluated for any migrational assessment for their degrees and will be eligible for professional jobs outside in the developed countries. In 2017, Pakistan’s first Internet Exchange Point (PKIX) was also inaugurated at HEC under the headship of Pakistan Telecommunication Authority (PTA) and support of HEC as well as Internet Service Providers (ISPs). The primary purpose of PKIX is to allow networks to interconnect directly, via the exchange, rather than through one or more third-party networks. It will also enable local networks to efficiently exchange information at a common point within Pakistan rather than exchanging local Internet traffic with outside world.